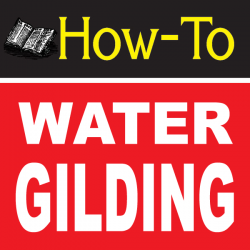 Water Gilding is part of the Art Process of Mirror Making known as Reverse Glass Gilding. The Basics of Applying Gold Leaf for Gold Mirrored Artwork, Letters and Lines. The term gilding covers a number of decorative techniques for applying fine gold leaf or powder to solid surfaces such as Glass, Wood, Metal, Stone, to give a thin coating of gold. A gilded object is also described as "gilt". Where metal is gilded, to make Gold-gilt or to vermeil objects. Water Gilding Gold Leaf and Precious Metals like Pure Silver and Palladium Leaf, Queen of Pale Gold with Gelatin produces a Mirror finish. Water gilding lesser materials Brass, Aluminum and Copper Leaf doesn't work well and often comes off right away. Imitation Metal Leafing took thick-heavy and doesn't allow the Gelatin Size to dry properly and are Better to surface Gild with Oil Gold Sizes. So when Water Gilding always use real Gold or Pure Silver and Palladium when your worried about the Silver Tarnishing right away. 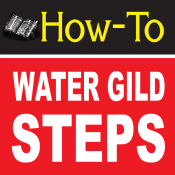 There's a How to Water Gild Step by Step Tutorial Listed Below. Right Handed Gilder's lay gold from left to right. Both groups work in direction as in lettering to keep their hands away from the gold just laid. Gild from top to bottom so as you add more water size, it doesn't wash or flow gold off or out of position.